If you have a problem with fallout or iron particles from your brake pads soiling your wheels, you will need to use the best iron remover for the job. Car care technology has rapidly developed over the last few years and the use of iron removers is now one of the most popular products in car detailing. Iron mist which stick on car surface or wheel rim is such a difficult problems, it is tend to create rust and spoil the original paint of the car. 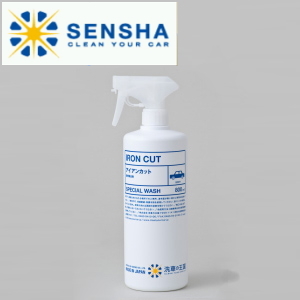 Iron Cut is the spray type iron powder remover and which works to dissolves iron powders. After spraying the product on areas affected by iron powders, the iron powders will change its color to purple. All you need to do is just to wash it off with water soon after this change happened, don’t leave too long to rinse. The product is suited for car body, wheels and even glass surfaces. Iron Cut is the spray type iron powder remover and it dissolves iron powders. After spraying the product on areas affected by iron powders, the iron powders will change its colour to purple. All you need to do is just to wash off them by water after this change happened. The product is suited for car body, wheels and glass surfaces. Iron Cut is pH neutral so that there are no chances to damage and cause discoloring to a car. Moreover, plated parts and plastic parts are usually damaged and stained very easily whereas Iron Cut will never cause these troubles. No professionalism necessary, the detailed instruction guide with photos is attached so that everyone can apply the product simply and get the same finishing. See the photo at the right. It shows an area where many iron powders are attached on a paint surface. Iron Cut has the strong capability to powerfully remove those irons without causing any issues. Iron powders can also be removed by a clay, specifically made to remove iron powders. However a clay often makes small scratches hence, compounds are required for polishing after the work in order to remove those scratches. With Iron Cut, you do not require rubbing on surfaces so there will be no scratches by this work and of course polishing work is also not required. All you need to do is to spray, wait and wash off. Iron Cut dissolves iron powders. The product is to remove iron powders. It is not suitable for removing water scales. For scale removal, please engage Scale Clean. The product only detects and remove iron powders, not paint mists. Please use Clean Clay for the removal of paint mists. You may need repeating an application of Iron Cut if there is an significant amount of irons on surfaces. If you wish to remove irons with one application, we recommend Clean Clay. Please be aware that Clean Clay may create small scratches after its application so that . a polishing work with Scratch Cut to remove those scratches could required after. If you wish to remove irons without making any small scratches, please apply Iron Cut multiple times.